Located next to Goofy's pool, and serving slices of real Italian pizza and tropical beverages. Choose from cheese, pepperoni or one of the daily specials. Perfect for a mid-afternoon or late-night snack. 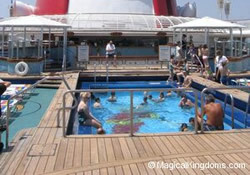 Deck 9 on the Disney Wonder and Disney Magic.